The Cuisinart Classic Bar Blender provides effortless blending, puréeing and liquefying capabilities. The high-performance, commercially rated motor is powerful enough to crush ice like the pros, right on your wet bar, dry bar, or kitchen counter. The powerful 550 peak watt motor and ultra-sharp stainless blades quickly and easily crush ice and turn fruits and veggies into juices and smoothies. Designed for simple operation, it offers two speeds controlled by a one-touch toggle switch. When blending’s done, the machine is a snap to clean – the sturdy zinc base wipes clean and the removable parts are dishwasher safe. The Cuisinart Classic Bar Blender - Aqua has many exciting features for users of all types. You can extend the lifetime of your Cuisinart Classic Bar Blender - Aqua with the purchase of a FactoryOutletStore Factory Protection Plan. 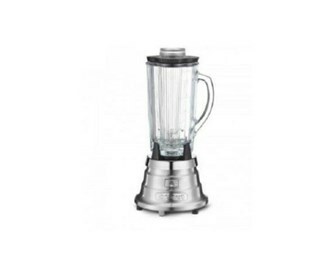 The Cuisinart Classic Bar Blender - Aqua is sold as a Brand New Unopened Item.